Published on March 19, 2015 in General T&T. 1 Comment Tags: Stephen Kangal. Statement Delivered by Mr Stephen Kangal at the Formal Commissioning of the Modernised and Dualed Southern Main Road at Frederick Settlement, Caroni on Wednesday 18 March 2015 @ 2:30 p.m.
Good afternoon! Namastay! Asaalam Alaikum! On behalf of the residents of the five Caroni Villages I extend a warm welcome to our Honourable Prime Minister Mrs Kamla Persad-Bissessar, Minister Dr. Surujrattan Rambachan and Party to Caroni this afternoon. Thank you for inviting three residents of the area to participate in this afternoon’s programme in order to give our input and insights into the completion stage of the widening and modernization of SMR Project and other development projects. 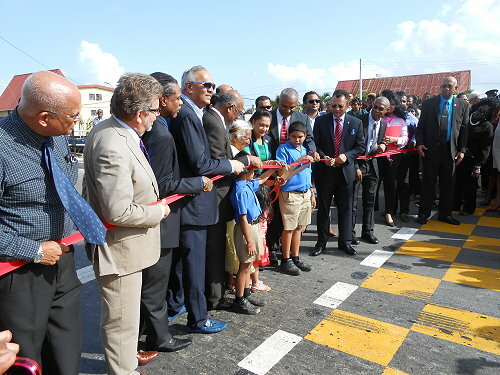 Thank You Honourable Prime Minister for coming to Caroni today with members of your Cabinet to declare open the modernized and upgraded SMR – a virtual highway. Caroni is truly honoured by your presence. The roadway was completed by three reputable contractors in less than one year. The Caroni Community offers its congratulations to Coosal’s, Junior Sammy, the PURE Unit and SIS. 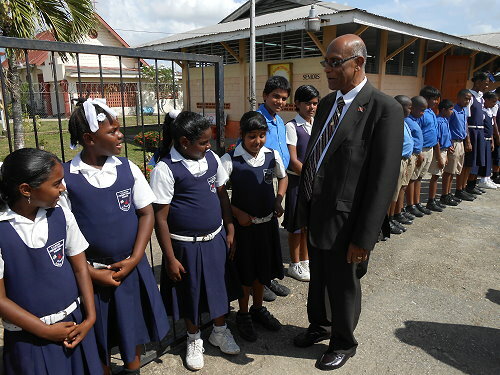 This is not your first visit to Caroni, Honourable Prime Minister. At the beginning of your People’s Partnership Government you will recall that you switched on the lights at the Frederick Settlement and La Paille play grounds. Well that initial light that you ignited in Caroni never faded- was never extinguished. It was like a fire-fly in the darkness of exclusion, historical neglect and underdevelopment. That light has now blossomed, blazed and become a meteorite. It illuminates the physical development and socio-economic enhancement from the sky above taking place in the landscape of Caroni below. Caroni as we know is ethnically speaking the counterpart of Laventille. Never in the socio-economic and political history of Caroni has so much being accomplished in such a short space of time for the benefit of residents- one year. Thank You for performance Prime Minister. This location on which we stand represents the pathway route by which our indentured jahajees/parents and grand-parents left the conjoined Caroni Barracks located on the banks of the Caroni River. They then occupied their new detached homes with one lot of land in Frederick Settlement in post- 1946. Frederick Settlement is a modern, well-planned and designed settlement administered by the Sub_Intendant of Crown lands. In 1946 and until 1952 this SMR was the only route to get to your hometown Penal and San Fernando from the North. This road was designed for bull- carts and horses. Today this modernized roadway is the route and catalyst to development and enhancement of Caroni as an emerging locational/manufacturing centre. The importance of this roadway is similar to what the old Caroni Railway Station symbolised and meant for Caroni until 1965. Then in 1965 sugar was both King. Queen and Jack and Caroni L:td flourished. Caroni was a transportation hub for sugar and river sand. Thank You Hon Prime Minister for making things that were hitherto considered up to 2010 impossible, politically incorrect and prohibitive, now real and possible for us in Caroni. Thank you for not only giving the motoring public a new road. But with that we now have a more efficient and functional drainage system. It almost guarantees and renders Caroni into a no-flooding zone for the first time in recorded history. Thank You, Honourable Prime Minister for siting the new MVA Building at Southern Main Road Caroni. We hope to welcome you again for the opening of this state of the art turquoise, imposing building that has transformed and modernised the once sugar-dominated landscape of Caroni. We In Caroni have noted the obstructionist stance of the Opposition in Parliament on the MVA Bill. But that is not new. We have to speak to Honourable Terrence Deyalsingh and remind him that he was born, bred and came from Caroni and he cannot oppose our interest- our right to development. They that is the PNM abandoned Walker Park into disuse and disrepair after 2002 just as they did with the Biche High School. They can still spite the people of Caroni again by leaving this spanking new MVA building unoccupied. But God forbid the occurrence of that accident and trauma on 17 September 2015. We thank you for the re- location of the Government Printery in the Frederick Settlement Free Zone outside of congested POS. Many of our people have found gainful employment on the Estate that will soon be expanded by 300 acres. We thank you for the completed Early Child hood Centre in Caroni as well as for the modernisation of the Caroni Conquerors Ground and the Frederick Settlement Playfield. We thank you for agreeing to build a new Caroni Presbyterian School starting in June of this year. Please start it so that the PNM, were an accident to occur, God forbid, cannot stop it. Honourable PM you have corrected the exclusionary injustice of the past. You brought us in Caroni into a 24/7 water supply and a modern period of infrastructure. Nothing can stop and deprive us of our strategic locational advantage as we benefit from the impact of the push and pull factors manifested along the new SMR Corridor of expanding business opportunities. We thank you for responding to our little demonstration mounted by Frederick Villagers late last year positively – not punishing and isolating us as previous regimes would have done. We record our thanks and appreciation to your Minister of Transport, The Honourable Stephen Cadiz who came to us voluntarily. He then provided us with an immediate bus service to ferry us to schools and Curepe and back. We in Caroni can call him anytime. He is our dear friend. Whatever happens electorally, You Honourable PM have stamped and emblazoned your leadership personality of the socio-economic and political landscape of Caroni as no other Prime Minister has done before. We will never forget how you empowered, cared for and truly emancipated us in Caroni. You have pioneered balanced and inclusive development and equity across T&T. This is the new political culture and the litmus test of good and effective governance. It is based on imperative of walk taking precedence over old talk and kicksing in Parliament. 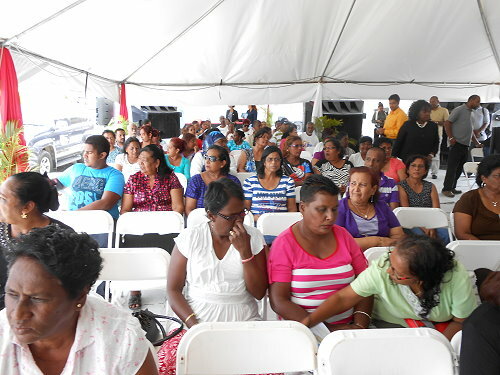 We in Caroni are thankful to you for shifting the rural-urban paradigm of development. You are changing the locus of attention and development from the monopolistic East-West Corridor to include the rest of T&T. Thank You the PP Government for bringing South of the Caroni River into the developmental mainstream. landscaping of the roadway, U-turns, etc. These can be addressed later on with the residents participating actively with the officials of the Ministry of Works. A cardinal principle of building a new Highway is balancing the interests of the host communities with that of motorists if not giving precedence to the former. Thank You Honourable PM and Ladies and Gentlemen! Photos show the Prime cutting the ribbon to declare the new SMR formally open and the residents in the audience. There is so much history associated with this settlement when Indian laborers were settled in the barracks to work the sugar plantations. Where the distillery site is, sadly non-functional, was the original sugar factory and across the river was the Orange Grove sugar factory that produced one of the finest yellow crystals of sugar in the world. The location of the distillery was earmarked to be the ‘Fermentation Complex’ whereby alcohol, baker’s yeast and vinegar plants would be the core. The bagasse complex was earmarked for BC and the Sugar complex at Usine. The effluent which is rich in potash, nitrates and phosphates would have been the liquid irrigant for rice cultivation for all 3 intended phases. Instead of the effluent polluting the Caroni river, the water from the river would be pumped into the effluent to reduce the BOD levels and be pumped into the rice fields. Why would anyone want to destroy the sugar cane plant which was the best converter of solar energy into potential energy?